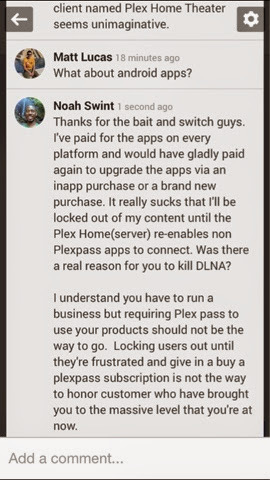 Noah's Blog: Plex Home. The end of an era. Plex Home. The end of an era. I know I'm going to receive a lot of hate mail about this. But I too a screenshot before my comment gets removed on Google+. Bait and switch requiring a Plex plass subscription is not a good look Plex.